When you have invited guests to a baby shower party from different social circles, you need something to break the ice between them so they can enjoy all the baby shower activites together and have loads of fun. I have created this Free Printable Find the Guest Icebreaker Game in three different colors. This is a fun introduction game and a great way to help your guests to get to know each other. How to Play: Print and distribute the game cards among your guests.This is an icebreaker game so it should be played in the beginning of the party. Ask the guests to talk to each other in order to get to know more about each other. Ask them to take signature of the other guest who meets the given specification, in the blank space given in front of each specification. The person who gets most signatures will be the winner. This is a cute and adorable free printable Find the guest introduction or icebreaker game for baby shower in blue color. Just click on this thumbnail image and a bigger printable image will open up, that you can save or print. 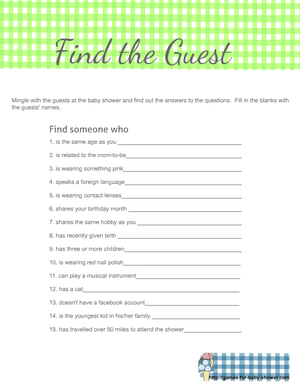 Here is this Free Printable Find the Guest Game in Pink color. There are 15 different specifications about different guests. The players will have to find maximum number of guests to win this game. This is a perfect game for a big party. Here is another free printable image for this fun icebreaker game. Just click on this thumbnail and a bigger image will open up, save it to your mobile, tablet or PC or print it right away.